Five bedroom home located within minutes of both Seven Springs and Hidden Valley ski resorts. This home, surrounded in a beautiful wooded setting, has everything you could want and more and surrounded in a beautiful wooded setting. It is located on a private 2 and 1/2 acre lots. There are two very large decks. One is located just off the kitchen and the other off the front that has a beautiful mountain view. 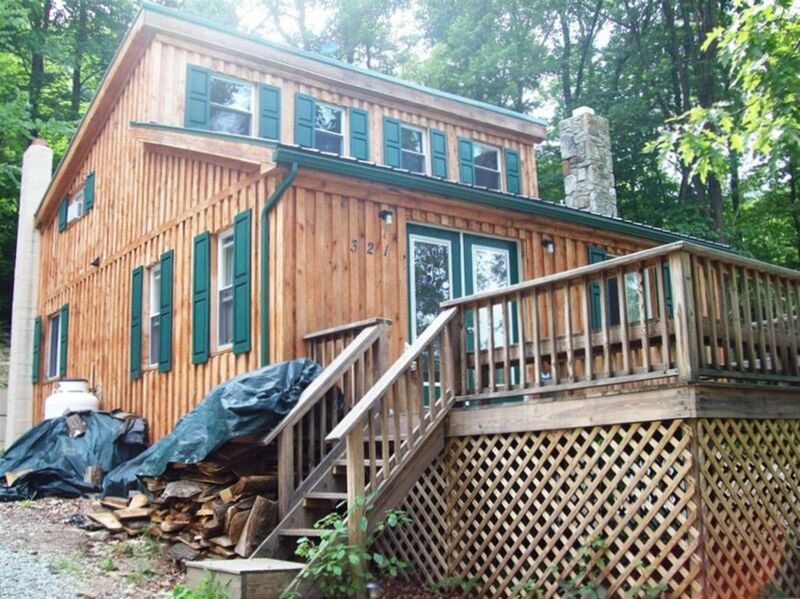 This is a unique opportunity to experience the Laurel Mountains within the privacy of your own mountain rental home. You will find this home to be a beautiful rental at an reasonable price. The home has five large private bedrooms. The master bedroom is located on the main level just off the kitchen and great room. There is a large pillow top queen bed. There are two large private loft bedrooms. Each bedroom has a double bed and dresser. Step out of the bedrooms and you have a walkway that overlooks the great room. There is also a desk area so you can read or do work and still have a view of the great room. In the completely finished basement there are two large bedrooms. The first bedroom has a queen bed, dresser, and large closet. The other bedroom has a king bed and dresser. Also in the basement is another living area complete with gas fireplace. Located there is a comfortable futon bed that provides additional sleeping accommodations. The great room has cathedral ceilings and plenty of space for the guests to spread out. There are numerous windows to let in the natural light and beautiful wooded scenery. All of the ceilings are oak. The are also wood floors. There is a beautiful stone fire place. All of the firewood is provided for free. There is a big screen television. We have added a unique bar/ counter that is actually made out of a large tree and still has the bark. There is seating for eight at the bar. There is a full kitchen that includes all major appliances and cooking utensils. There are 1 and 1/2 baths, separate from the sleeping quarters. The master bath has a shower with unlimited hot water, so many guests can shower without running out. The second is a powder room. The home is located within walking distance to the entrance to Forbes State forest. You can actually bike or hike right off the property. Both Seven Springs and Hidden Valley are just a short drive away. There are conditioning units in two of the bedrooms. This cabin is comfortable being that it is tucked in the woods. The downstairs rooms smell of mold and mildew. The kitchen is extremely small. The hot tub water was cloudy and didn’t seem clean. Both bathrooms are on the main level, which was tricky for the kids in the middle of the night if they were sleeping upstairs or downstairs. Had a wonderful time with friends. Plenty of privacy and space. Decorated nicely, had everything we needed, was clean but was musty smelling and could also smell strong pet odors upon entering. Would stay again if the price was lowered considerably and I was on a tight budget. Have stayed in far nicer places for less money. The owners were very attentive and helpful though!! Things we liked: spacious cabin with room for all of our family. Loved the space so the kids could have "room" and plenty of space for us to all be together. The decor was appropriate to the area, creating a very camp like feel. We really enjoyed the hot tub and the fire pit. It was helpful to have cookware and dishes provided along with a stove and refrigerator. Plenty of towels for the hot tub and shower. Plenty of DVDs and TV sets for viewing movies and even some non-electronic games provided. The downside, we were disappointed that the washer and dryer were not working. We hoped to be able to actually use the dressers in the bedrooms, but many of them were filled with cabin supplies. In the kitchen area it was difficult to locate some items because things were jumbled up, and again too many supplies were taking up room. Some lights did not work. Some of the mattresses on the beds were in poor shape, either badly soiled or damaged. The half bath should have places to hang towels to dry. There were only 2 kitchen towels for drying dishes. We did not mind doing some clean up at the end of our stay, but the broom was too small to adequately clean the decks. The dehumidifier on the bottom level did not seem to be working well, so it felt quite damp downstairs. We would recommend this cabin to others, but think it could be better. If you are going to state certain things on the website, then people would expect to find those things when they check in. The location is very secluded was a very nice get away only about 20 min from the resort and there's some golf courses Close also I had 8 people with me and there was room to spare. Had just enough room to fit everyone in there own room. It rained the whole time we were there but still managed to make a fire and enjoy the hot tub. Had a great stay!! Very cozy cabins and a delightful atmosphere!! We had great communication with the host and everything was wonderful!! Can't wait to go again!! So relaxing! !